Healthy Eating, Healthy World is written by certified nutritionist J. Morris Hicks, along with T.Colin Campbell, leading cardiologist and author of “The China Study”. They say the best action we can take to improve our health and preserve the planet is to consume more plant-based foods. The purpose of this book is to give you the practical information you need to achieve this goal. The authors outline some of the potential benefits that can be obtained by increasing your intake of unprocessed plant foods. This does not necessarily mean that you have to become vegetarian or vegan. But you will need to limit your intake of animal products, while emphasizing fresh fruit and vegetables. This eating plan involves obtaining at least 80 percent of your calories from whole plant foods. You will also limit your fat intake to less than 20 percent. You will start by evaluating your weekly eating routine, being on the lookout for hidden sources of calories. For example, salads are generally regarded as healthy but often contain high-fat ingredients like cheese, eggs and oil. Your goal is then to establish a new routine for your meals that is focused on healthier choices. General advice is included to help you plan meals but the book does not include a meal plan or recipes. Readers are provided with a descriptive list of recommended books for further information and practical resources. Brown rice, quinoa, whole-grain bread, oatmeal, black beans, hummus, tofu, berries, apples, bananas, spinach, broccoli, tomato, carrot, avocado, olives, flaxseeds, walnuts, almonds, soy milk. Readers are encouraged to engage in regular exercise as an important component of a healthy lifestyle program. However, Heatlhy Eating, Healthy World does not provide specific exercise guidelines. 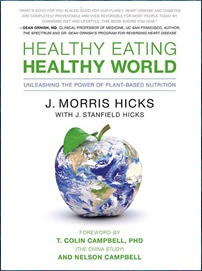 Healthy Eating, Healthy World: Unleashing the Power of Plant-Based Nutrition retails at $14.95. Diet recommendations are supported by scientific research. May reduce the risk of chronic conditions including diabetes, cancer and heart disease. Not necessary to completely eliminate animal products. Educates dieters about hidden sources of calories and fats in food. Increases awareness about food quality. Advocates choices that support the environment. Necessary to obtain other books for meal plans and recipes. Many dieters will need more information to create a balanced meal plan. Requires avoidance or a very limited intake of many foods. Some dieters will require supplements of vitamin B12 and vitamin D.
Healthy Eating, Healthy World outlines the benefits of eating a plant-based diet to improve your health and support the environment. It is not necessarily to become a vegetarian to follow this program. However, your goal is to consume at least 80 percent of your diet as whole plant foods.